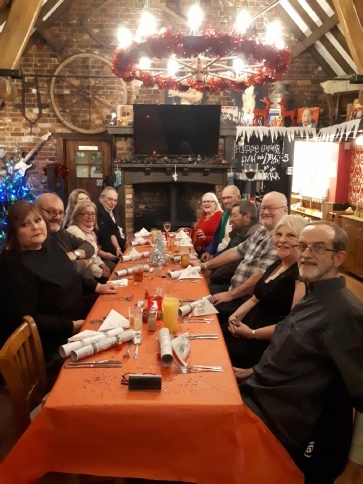 FIVE members of the Disability Action Group (North Dorset) have been supplied with brand new mobility scooters as a result of grant funding and donations received from a number of organisations. The charity, which has operated in North Dorset since 2001, is grateful to the Spectrum Community Fund for a grant of £2000, Shaftesbury Town Council for a grant of £500, the Alice Cooper-Dean Charitable Foundation for a grant of £2000. 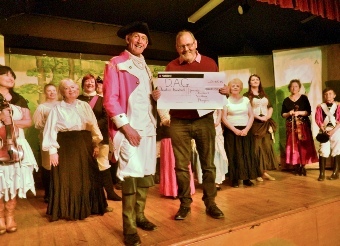 Most recently it has received a donation of £1200 from the Tarrant Valley Players as a result of being their nominated charity for proceeds of fundraising at their productions over the past year, presented on Thursday at their performance of ‘Waterloo’ by chairman Adrian Tuite to DAG Trustee Mike Well (pictured right). Disability Action Group (North Dorset) has gone from strength to strength since opening a unit in Nightingale Court, Blandford, in September 2012, which has allowed it to build its profile, increase the number of vehicles available for hire, and so increase the number of disabled people helped to maintain their independence in the face of mobility problems. Thanks to its small team of volunteer staff in the office and workshop and the modest charge for the hire of equipment, the project is now virtually self-supporting, and the majority of grants, donations and sale of second-hand equipment can be applied to replacing its ageing stock, so reducing demand for repair and maintenance. 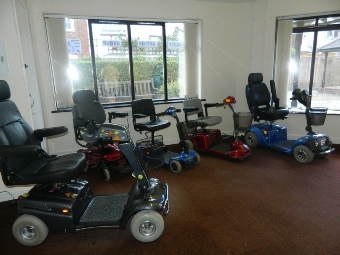 The unit is also able to open five days a week, and in addition to long and short-term hire – invaluable for those whose mobility problem may only be temporary – is also able to offer daily and weekly-hire of wheelchairs and scooters to visitors to the area, and servicing and repair to members’ own equipment. We occasionally sell scooters when asked, and use the proceeds to invest in replacements, but demand frequently exceeds supply. So we are always very grateful to receive further donations so that we can reduce what has become a waiting list, particularly for 8mph machines. Enquiries welcome from those in need of mobility assistance, as well as offers of help in fundraising, scooter maintenance or as unit and administrative assistants. See Find Us for more information.